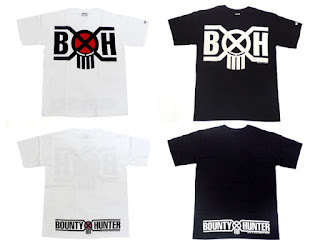 Span of Sunset in Los Angeles recently re-upped their stock of the Bounty Hunter classic logo tee. White on black or black/red on white. In either color, the classic logo is a definite fan favorite. Make your move and jump on these quick as they're guaranteed to sell out. While on the topic of BxH, I picked up the November 2004 issue of Garden magazine at Munky King with a special feature interview with Hikaru Iwanaga. A very good read in three different languages (Mandarin, English, Japanese) that gives a little insight into the inspirations and meanings behind "Bounty Hunter" (Boba Fett, anyone?) 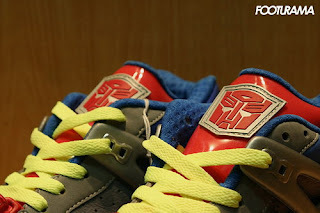 , BxH around the world, and future of the trendy Harajuku brand. 120% pure goodness. If you can find it, I suggest picking it up. Bossy Bear: He wants everything HIS way! Fuzzy Wuzzy was a bear. Fuzzy Wuzzy had no hair. But who gives a crap about him when there's Bossy Bear?! 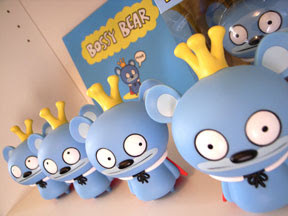 Bossy Bear, the little blue bear clad in a red cape with a crown upon his noggin, comes from the insanely creative mind of David Horvath, co-creator of Uglydolls. Bossy Bear is his picture book debut. Woo-hoo! The story is about a bear who is, uh, bossy. He wants everything HIS way, and he wants it NOW! This book will have readers recognizing - and laughing at - their own bossy tendencies, or so Barnes & Noble says. They also said that this book is targeted towards infants and preschool kids -- but that isn't stopping me from getting a copy! We're all kids at heart anyways, aren't we? 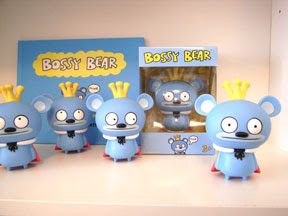 And to add more fun to the hoopla that is Bossy Bear, there's going to be four, count 'em FOUR, vinyl figures! You can get Bossy Bear looking this way, that way, sideways, and front ways. What fun! I think I like him looking that way. I'm not sure when those bossy boys are coming out, but the book is to be released in May. If you're there, go see him! 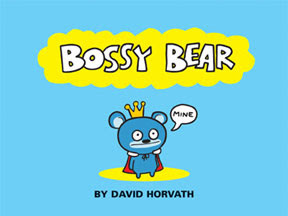 For more on Bossy Bear and all other things Horvath, check out David's blog. I never use to be a big fan of sushi. First of all, I don't really like fish, so the idea of eating them raw totally threw me off. I'm still not too big on the fishy taste of most seafood, but I have grown a liking to sushi... at least some sushi rolls. California rolls and spicy tuna rolls are among my favorites. So why all this talk about sushi you ask? I just happened to come across this website, thanks to rye-uhn-air-ick, that sells sushi roll pillows! The Original Sushi Pillow was created by Mel Maghuyop and Cindy Tomm, two actors who thought of the idea while on the U.S. tour of Miss Saigon. Cindy thought it would be a neat idea to have pillow that looked like a California roll and after failed attempts to find one, Mel decided to make his own... the first sushi pillow was born. To see the full menu and/or order one of these tasty pillows for yourself [or me], head over to The Original Sushi Pillow. Don't see your favorite sushi roll on the menu? Not a problem! The Original Sushi Pillow offers custom orders - just send them a picture and they'll do their best to replicate it. 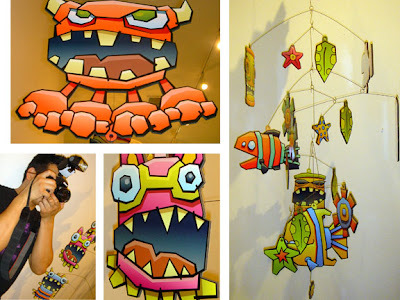 Cameron Tiede's mobile is wonderful for a kid's bedroom or play area or a big kid's office space! Aren't they the friendliest monsters and sea creatures you've ever seen? Those are the kind of (lovable) monsters I wouldn't mind finding hiding under my bed! Luke Feldman's harem of hunnies are gorgeous. Luke was there to sign a deck Murse1 purchased at the show. Nice fellow. Don't 'cha wish your deck was hot like his? Zeptonn's wild zoo was a delight to just stare at. So much going on! And I love how the vinyl art framed their sly decks. 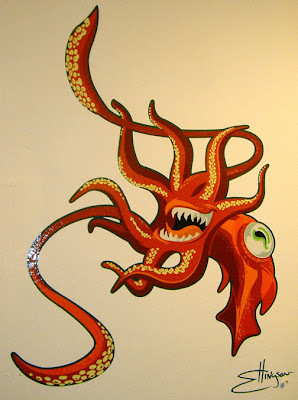 Josh Ellingson's "Laughing Squid" is another piece that just makes me smile. 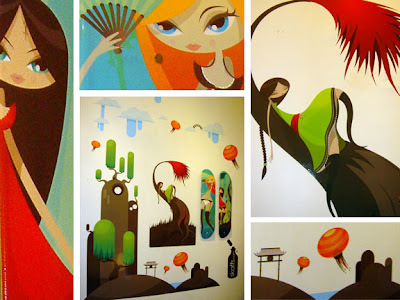 You can see more fabulous pieces and purchase the Vinyl Art/Wall Decals and skate decks on Pop Cling's site. Looking for more? Urban Outfitters has a few and Blik is another great source. Scared of starting off so big and so permanent? 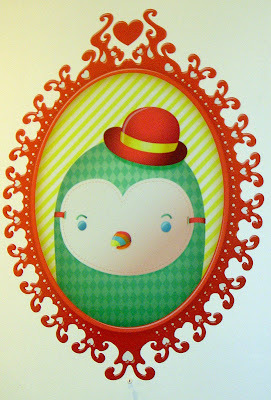 Take baby steps...Check out the Hostess Blog's post about Blik's smaller removal decals. This shirt design called "Also Sprach Miyamoto" has proved to be very popular as it has shown on many popular blogs, however was never printed possibly due to intellectual property. Nintendo needs to contact this designer because they're missing out on some mucho moolah, including some from myself! I love Nintendo related anything, but they're always especially awesome when those things are kids' meal toys! It looks like the next set of Wendy's kids' meal toys are all Wii related! From the looks of things, my guesses are that they're a Wii remote that shoots coins, a wii remote that repels/controls mario on a shell with magnets, a puzzle, a wii sports baseball game, and an excitetruck. I love how they used those 'invisible stagehands' effect like in those viral videos of japanese game shows. But my favorite kids' meal toys of all time have to be the ones for Super Mario Bros. 3! Ahhh, those times when fun was found in a clear plastic wrapped package next to your small fries. I am SO thrilled to be a lucky owner of the Fornarina Tokidoki Deva! The special delivery came in last night via my stylist. He's the best! He was able to track them down and get on a waiting list. The Fornarina Store in L.A. called last Friday to give me great news that their first shipment from Europe had just arrived. Umm, ya, there's two boxes...I couldn't decide on the Black or White ones...so I got both? Ying and Yang = balance, right? These are so comfortable, I swear I can go running in them! Hehe, I know my boyfriend just rolled his eyes. But they are soft and comfy in comparison to most heels. 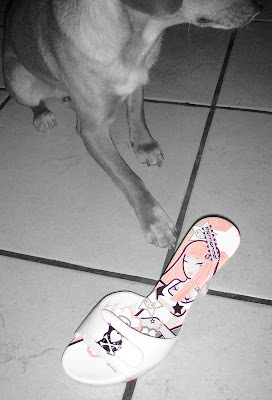 The insoles display the famous Tokidoki artwork (that unfortunately is covered when worn) and have a good cushion thickness to them -- and you know that cushion is a must for heels! The outsole is plastic but directly under the ball of your feet is a rubber inlay (which is decorated with a crown pattern.) Another smart move -- the rubber inlay is the perfect solution to minimize slips and falls for those who tend to slip when they walk (or dance!) in heels. The heel is not too high and not too low -- measured from floor to top of insole heel - 3.5 inches -- not high at all, right? Keep in mind that the cushion is thick and the outsole below the ball have height to them as well. The arch on the shoe feels good too. It feels as though it follows your natural arch, another hard find. They come in Euro Whole Sizes. I think the strap is adjustable just like the Dr. Scholls sandals, but I haven't figured out how to adjust them yet. 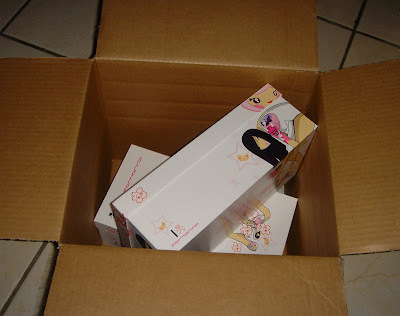 And if that wasn't good enough, they even come with a Tokidoki anklet and a gorgeous box! I think I will be converting the anklets to bracelets. For now, the shoe boxes will keep my Devas immaculate, but I'm sure after a month or so, the box will be used for storing something else. Girls, you gotta get this shoe! Not only is it way stylish, but it will make your feet happy! It's way comfy and can be dressed up or dressed down! How great is that. They run for $170. But just divide that by the number of times you're gonna wear them...I'm telling you, its worth it! Oh, and the compliments you'll get! AND its a limited piece of art! And you know how pricey rare art can be! Can you believe all I did was talk about shoes on this post?!? My Gollie. Heroes is FINALLY back! 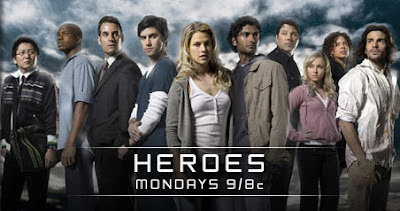 I must admit that Monday nights just haven't been the same for me since Heroes left us hanging back In March. Now I can finally go back to sitting at the edge of my seat while I watch the story of these "ordinary people discovering extraordinary abilities" unfold before my all too eager eyes. I hoped to find answers to the questions lingering in the back of my head for the past month and a half, but in true Heroes fashion, the conclusion of this newest episode has only left a series of new questions... What is Linderman going to use Micah's abilities for? How does Mr. Bennett plan on stopping OWI [Organization Without Initials... how ironic]? What happened [or didn't] that made the foreseen explosion come to fruition? What did Isaac paint to show how to stop/kill Sylar and will the right people see these drawings in time? Wow... I'm getting ahead of myself. Allow me to backtrack a few steps and introduce myself. My name is carmeL, and I have a tendency to get overly excited about the things that interest me... some might even say I get a bit obsessive [yes rye-uhn-air-ick, that means you]. Whenever I discover something new that I really REALLY like [i.e. a new video game or TV show] I can't seem to focus my mind on anything else, at least for a short period of time. Call it a selective, short-term, obsessive fascination. I trace these obsessive tendencies back to the era when New Kids on the Block ruled the world [at least they sure ruled mine] and include the USA Cartoon Express, slap bracelets, Lisa Frank, & the Sanrio Store... you get the picture. So back to my current fascination with Heroes. I swear Heroes is like a drug and I'm a full-blown addict. To hold me over until I can get my next Heroes fix, I generally head over to the Heroes website to check out the latest chapter of the online graphic novel and peruse the theories other fans are posting on the message boards. I personally like The Unified Theory v3.0 thread. Some of the more interesting theories include one where Sylar is actually the one to stop Peter [the bomb] from blowing NYC to shreds for his own personal gains. Getting the scar Future Hiro was talking about on the subway? While I like to read other people's thoughts on how the show might progress, I haven't really developed my own theory as to what is going to happen. 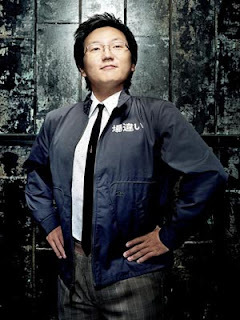 However, I will say that one theory is peaking my interest... Perhaps Future Hiro's intervention with Peter on the subway has started the chain of events that leads to the destruction of NYC. Not saying I completely agree, but just a thought to hold you over until next Monday. I be Pirate, show me yaar booty! Avast all ye land lubbing dorks, nerds, and goobers on the interweb! My name is Nina and that means "Little Girl" in Spanish -- in case you didn't know. I think my name suits me quite well because I constantly act like a kid. Wee! What can I say? I suffer from Peter Pan syndrome and the occasional Writer's Block. I'm an English major, so that totally entitles me to be a weirdo too and hence my occasional Writer's Block. 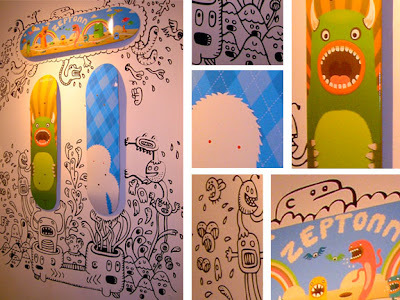 As a kid, I loved being crafty and often doodled (mostly on the walls) and daydreamed instead of doing my homework. Come to think of it, I still do that! I also grew up on a heavy diet of Nintendo, Sega Genesis, My Little Pony, Care Bears, Strawberry Shortcake, Shera: Princess of Power, Teenage Mutant Ninja Turtles and all things Disney. I'm a ginormous Disney Dork -- you so don't want me to elaborate! And as for my love of the fantastical eye candy and goodies that contemporary artists have been coming up with these days, I suppose I'd have to thank Mister rye-uhn-air-ick for that. He gave me a set of Kurt Halsey buttons as a graduation present three years ago. 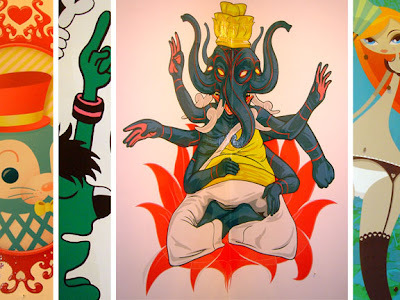 From there, I checked out Kurt's site, clicked on links to other art galleries and discovered Seonna Hong, Tokidoki, and Shag . . . which now brings me back to my bit on pirates. Josh Agle, better known as Shag (he got his alias from taking the last two letters of his first name and the first two letters of his last name - Josh Agle), was comissioned by Disney to design merchandise for their 50th birthday celebration in 2005. 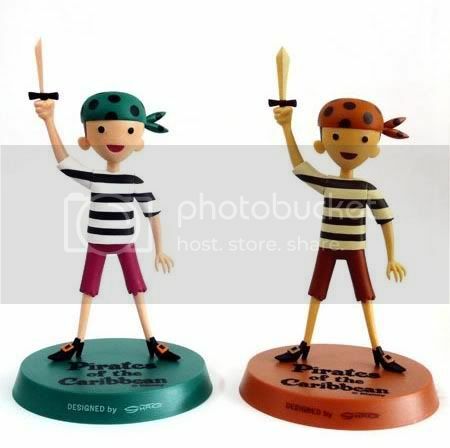 With the birthday bash long-gone, a vinyl figure of his Pirates of the Carribean boy has been made for us to take home! And in two different colorways -- color and sepia. 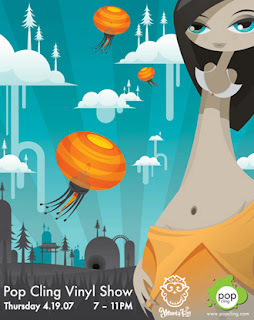 These guys can be purchased at Shagmart, Strange Kiss, and Rotofugi. Only 500 have been produced worldwide! 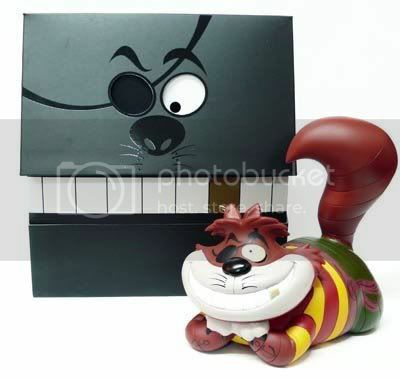 Alice in Wonderland's Chesire Cat has become quite popular in the Urban Vinyl/Art toy world and he's gone under various makeovers. Released earlier this year was the Pirate edition. This peg-legged feline can be found for $75.00 (ouch!) at Munky King. He's a rare one. Sailing away from Disney, but keeping with the "pirate" theme, I present to you Sket One's Blackbeard. He lands to shore on May 17 and comes with all the things a pirate could hoard: a treasure chest, map (to find the burried treasure! 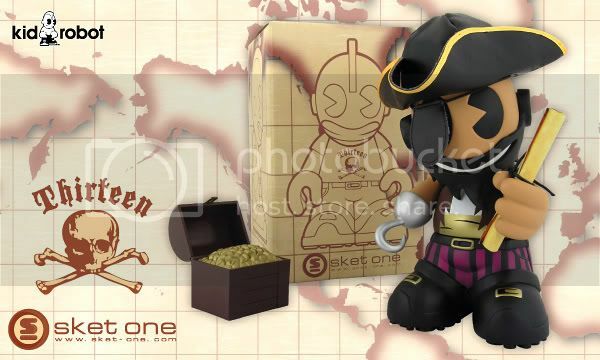 ), hook, removable beard, eye patch and hat! Keep an eye out (since the other one should be covered with an eyepatch) for him on Kidrobot. And lastly, Tokidoki. 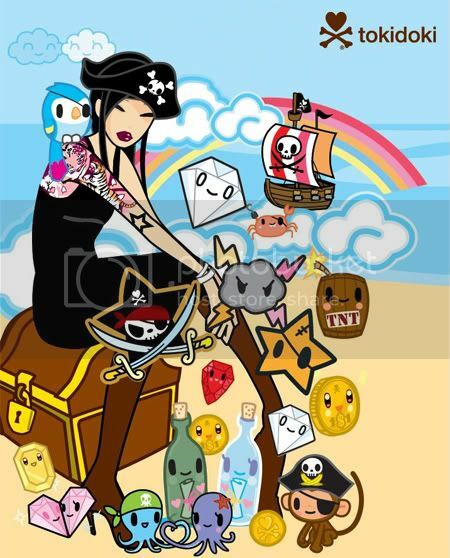 We here at Okee Dorkee are Tokidoki fanatics! But that can all be said in another blog. 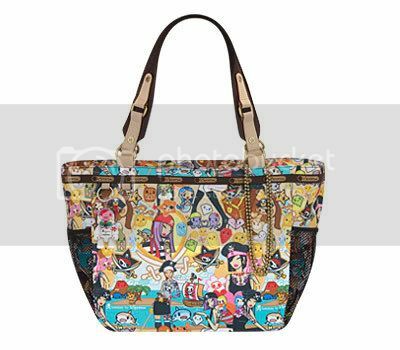 Once again, Simone Legno (Tokidoki creator and Okee Dorkee's homie), has teamed up with Lesportsac and released a fifth collection of bags and accessories with a "pirata" print for Spring 2007. I have the Buon Viaggio style tote shown above. It's big enough to hold all my "booty". Yaar. 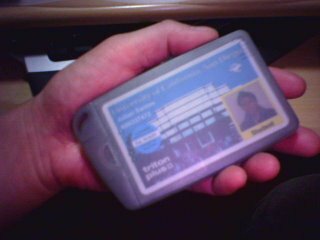 Janus Saint here, blogging using my trusty sidekick 2! Jimi wallets have been out for quite a while but they're worth noting as they seem to be on sale in many places like urban outfitters. The tagline for the jimi is "The wallet for people who hate wallets" as they overcome many of the obstacles of regular wallets as they are organized, water resistant, and thin. 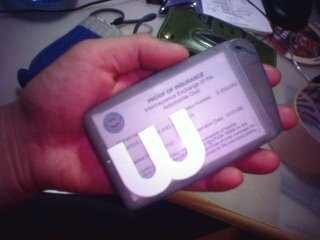 They're also good alternatives to moneyclips, cigarette cases, and business card holders. They have two types of jimi wallets. 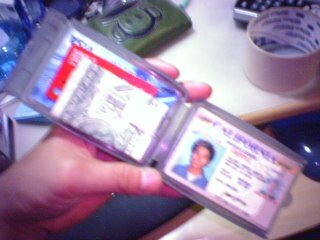 The original jimi can carry about 5 cards and has a removable moneyclip. The jimiX has the moneyclip on the outside allowing for more storage and can also double as a belt loop. Here's my smoke colored jimi. I customized it with a #3 vinyl sticker. 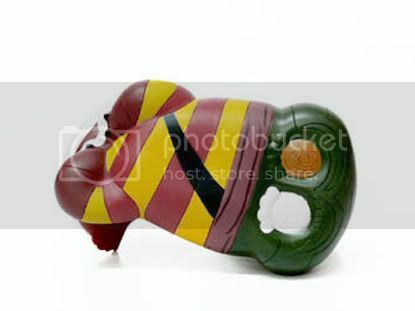 They come in all kinds of colors and are made of recycled materials. San Diegans will note that resident radio personality AJ from AJ's Playhouse on channel 93.3 has been making a daily topic of his switch to an orange colored jimi noting that they're great conversation starters. 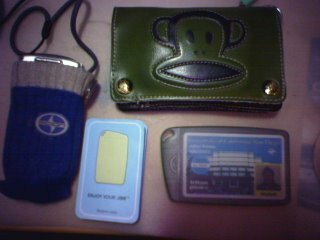 I have transferred my huge oversized paul frank wallet to the jimi. I picked one up myself because my goals for this year has included getting more organized and simplifying my life (lifehacking). Hello world and fellow dorks. I’m Christer. If you’re wondering, it’s not a typo. It’s in fact, Norwegian. However, I am not Norwegian. I’m currently going to school in Pomona and it constantly smells like horses. Please forgive all my grammatical and or technical errors… or whatever. I haven't written anything for a while. Things that interest me include (but not limited to): huge robots, robot-killers, photochopping, cult classics, a solid pair of denim, good eats, women, and I also recently took up golf. I like to keep things basic, yet eccentric. Minimalism with a kick, I suppose. Expect a wide array of random things from me and try not to take me so seriously. When I was about 10 or 11 years old, I had a friend named Koji. He always had the coolest toys and video games as they were all from Japan, and as we all know, Japan is always 2-3 years ahead of all baka gaijin. One day after school, after making a stop at the ice cream man for the usual soda and chicarones, I headed over to his house to play Dragon Ball Z: Legends. When I walked into his garage he had this miniature oval racing track. 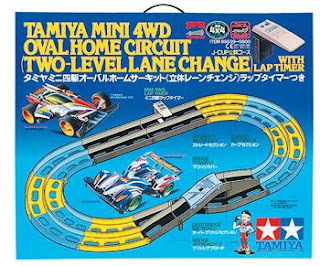 I found out that Tamiya produced these slot racing cars at a 1/32 scale that would run these tracks without a remote control, but just by motor and battery. These things immediately grabbed my attention. The different car designs, tuning the cars for speed and stability, the science behind upgrading your own machine… it was all awesome to me. The size of your wheels, types of tires, motor, gear ratio, side rollers, ball bearings, and weights. All of that mattered in the design of your machine. 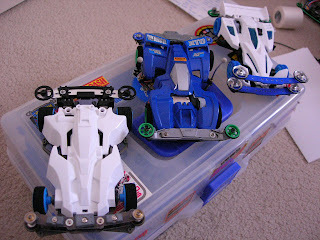 I remember going to the then Yaohan (now Mitsuwa), and getting my first machine, the Magnum Saber. It was one of the more basic cars and it came with a stock motor. Unfortunately, I used to run it on my parent’s carpet and not on a track. 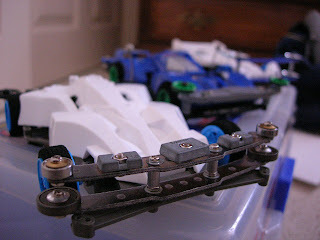 This resulted in the car crashing into the wall and snapping the chassis. My neighbor, however, ran his out in the front yard and went straight into the gutter. For the next two years or so, I saved my lunch money periodically just so I can get a new machine and upgrade parts. 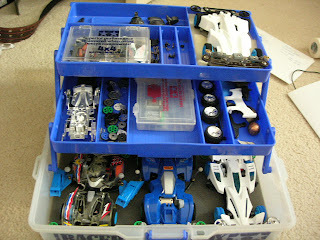 Koji on the other hand, already had plenty of parts to upgrade with so his machines were a lot more stable than my own. Eventually, Koji moved to Canada and so did his race track. 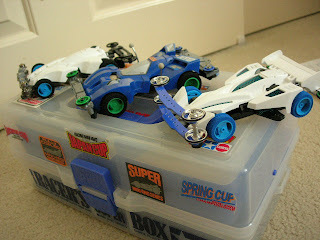 I had all these cars, their upgrade parts, and even a nice little racer’s box. 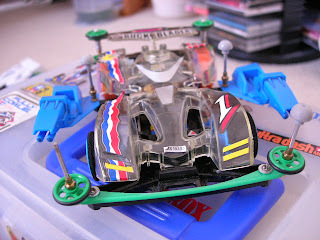 Sometime in the near future I’d like to buy a track of my own (they have add-ons and upgrades for tracks too) and race these cars once more. If anyone out there wants to race and get smoked, get at me. Murse1, RETSIRHC, and I attended the Pop Cling Vinyl Art Show last night at the Munkey King shop in Los Angeles. Stay tuned for reviews on this popular type of art application as well as the artists and the night's pix of fun, booze, and exhibits. 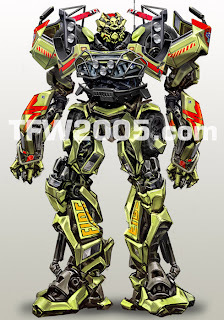 I grew up in a household in which Optimus, Megatron, and Starscream were household names and I'm tremendously dissapointed in the amount of change in the movie, but I suppose that with progression comes change - change that isn't necessarily for the better. 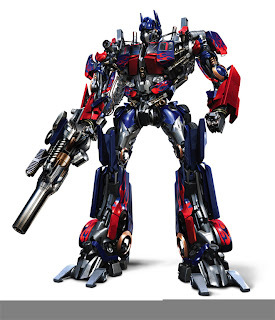 Optimus looks like crap. 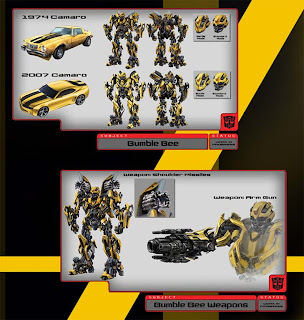 Bumble Bee is a Camaro?! 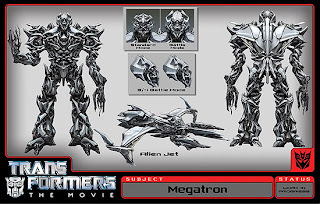 And what the hell is Megatron? Isn't he supposed to be a gun? I do have to say that some of the character designs are quite neat though. I love what they did with Jazz and Ratchet. Those two look pretty darn good. I saw these Nike Free 7.0's on niketalk.com a little while back, but there wasn't much info on them at the time. So I decide to look them up on Google earlier today to see what's going on with them and I found a website selling the pair for $58...but they were sold out...and it was just a pre-order! Crazy! I'm going to have to do some hunting for those. 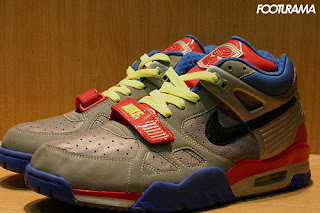 Pictures of these Nike Air Trainer III's surfaced a while back also and I have to say that I kinda like 'em. 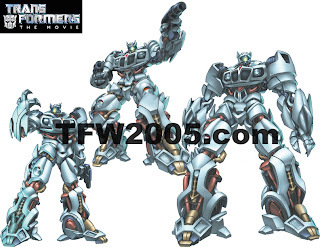 I don't need them, but if I saw them at a decent price, I just might have to buy them solely on their tie to Transformers.